Banjos are ornery critters. Like a puppy who wants to be petted, your banjo wants to be tuned. Often. So how do you tune banjo? Before you go running out to purchase an electronic tuner that you may or may not need, let me explain how to tune the banjo to itself. If you’re a beginner, you’ll be playing by yourself at first, so as long as your banjo is tuned to itself, you’re good to go. Set the banjo on your lap, and play the 1st string (closest to the floor). Put your left index finger on the 2nd string at the 3rd fret. (Think of a “fret” as the space between the metal bars.) If they don’t sound the same, you’ll want to adjust the second string so when it’s fretted at the third fret it sounds the same as the 1st string “open” or unfretted. Important Hint: Before you turn a peg to tighten or loosen a string, you must play the string as you’re turning the peg. That way, you can tell if you’re turning the peg in the right direction, and you can estimate how much more you’ll need to turn the peg to get it in tune). Tuning Tips: If you have a friend who plays guitar, they can help you tune your banjo. In fact, the 2nd, 3rd, and 4th strings on a banjo are tuned the same as those same strings on a guitar. Piece of cake! Electronic tuners are a great invention, but before you use one, you really need to learn the tuning method, above. This will develop your ear. After you’re proficient at tuning by the “fret method,” you can invest in an electronic tuner if you want, but they are optional. Their best use is to fine tune your banjo after you’ve got it “roughly tuned” using the fret method, above. To use an electronic tuner, you’ll need to know the names of your strings. Merely turn on your electronic tuner, and play one string. Your tuner should light up and tell you the name of the string you just played. The lights or meter will tell you whether it’s too high or too low. Adjust your strings accordingly. For REALLY SIMPLE instruction on learning to play the banjo, I highly recommend one of my best-selling banjo books. 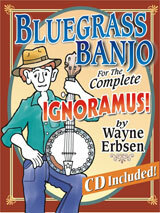 Bluegrass Banjo for the Complete Ignoramus! has taught thousands of people just like you to play the banjo in bluegrass style. 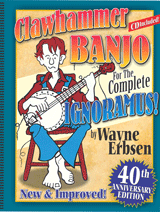 My book Clawhammer Banjo for the Complete Ignoramus! has done the same for people who want to learn clawhammer style banjo. Don’t know the difference? Then read my article on “What is Clawhammer Banjo?” My banjo books are written in a friendly and easy style expressly for total beginners. Each book comes as a set with a CD with 90 tracks where I play each melody very slowly and clearly on the banjo. I’m so sure that you’ll like the book that I’ll offer you this guarantee. If you purchase the book and CD set ($19.95) and either don’t like it or don’t get anything of value out of it, return it, and I’ll send you a check. I only ask that you USE the book first. Fair enough? Bought the Misus one for Christmas! This should be fun!!! It a six string and could be tuned the same as a guitar but what tuning would you recommend for Bluegrass? Regards Bob. 6 string banjos are a lot of fun- they are generally tuned like a guitar (EADGBE from low to high) regardless of the style of music. I been wanting all my life. To play a banjo I just got one from a friend it was just sitting there I ask if I could see if I could learn to play it. So he told me take it on I am not a young person anymore. But this is ok for me because you don’t have to walk or run to do it. So hold on to your hats I did what you said and I tuned it. Wow you are doing good so far. Let the music 🎶 begun. Just wanted to let you know thanks to your help i am really getting on well with my banjo,only one problem its out of tune now and i am scared of tuning it. I know its stupid and im a wuss but i am worried its going to make a heck of a bang if i over do it . Please can you tell me is it that bad? Just read your info. It is much easier to tune using the fret method if you start from #5 string and go 4,3,3,1. This way the string you are tuning is the “open” string. I have had a banjo, 5 string, for years and was to busy to practice. Gave it to my younger son. He is learning. Got me interested. So, at 79,and now retired, not much to do, soooooo, just bought anew one and am now learning. Will get your books. Have played guitar for many years. I dont understand why the 5 th string on banjo music is always on the bottom. why isnt it on the top of the music measure?? ?